Need to print off some Australian money for your class? Make it unique and original but at the same time closely resemble Australian money in appearance, size and decor. All Australian coins and notes are included. 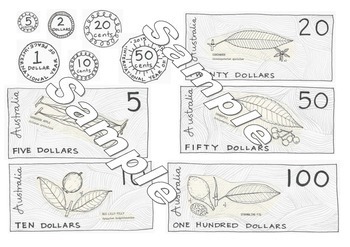 Hand drawn with Australian tropical plants featured on the front of the note. Commemorative one dollar and 50 cent coins - just like real life and a great conversation starter. The files are organised so they can be printed on different coloured papers to best resemble real Australian money. Thanks for buying and leave some feedback about how and when you used it! Thanks.